Identification and functional assessment of potentially restorable wetlands. Prioritization of wetland restoration opportunities. Assessment of functional benefit gains and potential wetland credits of restoration efforts. Painter Creek Subwatershed (PCW) of the Minnehaha Creek Watershed District (MCWD) includes approximately 8500 acres of mixed development, farmlands, woodlots and wetlands primarily located within the cities of Medina, Independence and Minnetrista. Water quality monitoring efforts by the MCWD have revealed PCW to contribute more phosphorous to Lake Minnetonka than 5 other Lake Minnetonka tributaries combined. To address this problem, a study was initiated by Kjolhaug Environmental Services Company in the spring of 1997 to identify and prioritize wetland restoration opportunities within the PCW. A primary project assumption was that the restoration of significant wetlands would increase nutrient uptake functions within natural wetlands and subsequently decrease the discharge of phosphorous into Lake Minnetonka. 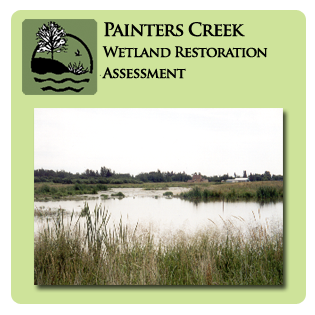 Functional assessments of 124 wetlands within the PCW were completed and compared to 8 identified reference wetlands. Restoration opportunities were assessed and prioritized at 31 wetlands with the highest potential for significant restoration benefits. Potential restoration benefits were assessed by comparing before versus after functional levels of flood attenuation, nutrient removal, and other selected wetland functions. Wetland restoration opportunities were rated by combining ecological benefits with constraints to restoration (i.e. number of landowners, land costs, and physical ease of restoration).